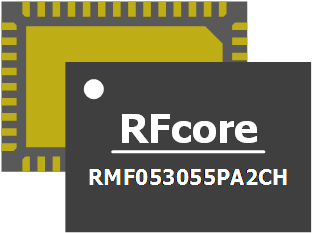 RFcore developed C band two-channel CMOS core chip for weather radar application. RFcore developed C band two-channel CMOS core chip for weather radar application. 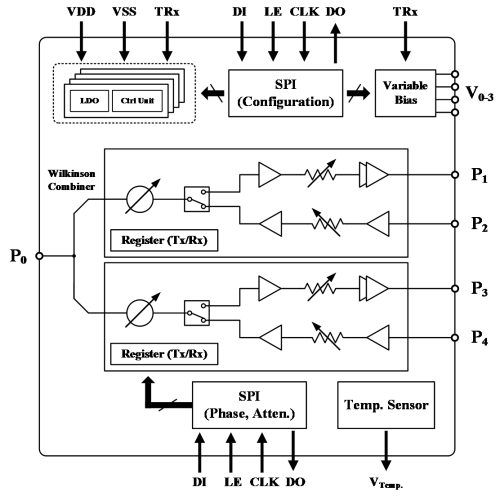 Each channel includes 6-bit phase shifter, 6-bit attenuator, 4-bit tuning circuits, gain blocks, low dropout regulator(LDO), serial to parallel interface(SPI), and variable bias output with -5~-1V output used to bias external devices. It covers frequency range from 5.0 to 5.8 GHz, phase shifting range 360° with 5.625° step, and attenuation range 31.5 dB with 0.5dB step.